Here’s a rarity. 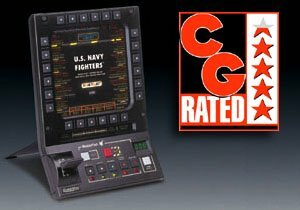 First produced in 1997, the Quickshot Master Pilot is a mock-up of a Multi-Function Display – or MFD – a device found on most military aircraft (and in some space combat sims like Privateer). It has rows of buttons around where you would normally find a display screen on a real MFD. Where the display should be, there’s a slot for you to slide in cardboard inlays which describe what each of the 24 buttons do. You’ll also find a bunch of illuminated buttons along the bottom. Depending on the what mode the unit is in, the main buttons will function differently, and the modes are dictated by the illuminated buttons along the bottom of the unit. Also on the unit is a little throttle lever. It’s not an analog lever, I imagine they’ve programmed it digitally to emulate a throttle in games that use one, and it does work, only in slow increments. 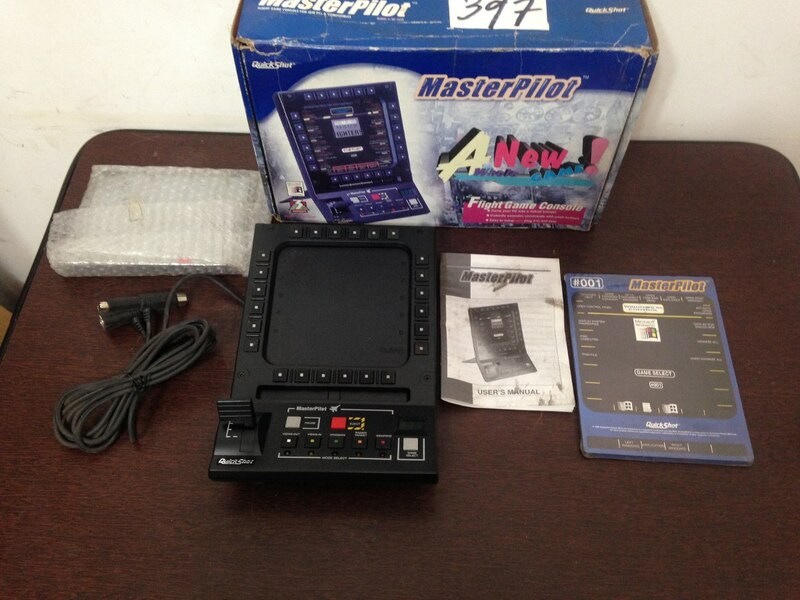 The Master Pilot connects to your keyboard, so it’s essentially just a keyboard emulator. As cool as it looks, there are unfortunately some ‘key’ limitations. The unit ships with a cartridge that slides into place on the bottom left hand side of the unit, and it has only 32 simulations and games programmed into it. This means, if there’s a sim you’d like to use with the Master Pilot which isn’t supported, you’re just plain out of luck. To add insult to injury, I’ve found that many of the pre-programmed functions they had configured were lacking some of the basic controls vital to the game in question. For instance, in Wing Commander III, they don’t have any buttons setup for communications, which constitutes a vital part of the game. In Advanced Tactical Fighters (Jane’s ATF) there is no button to open your weapons bay. QuickShot later released an accessory device that allows one to reprogram the module, but by default you could only play the thing with a list of 32 games, including: Apache, ATF, Absolute Zero, DOOM, Duke Nukem 3D, Descent, Dawn Patrol, Falcon 3.0, EF 2000, Earthsiege 2, Aces over Europe, Wings of Glory, US Navy Fighters, Star Rangers, Microsoft Flight Simulator, System Shock, Top Gun, Tie-Fighter, X-Wing, Privateer, Wing Commander I, WC II and WC III. A lot of great games are not supported – AH-64D Longbow, HIND, F-22 Lightning II or Mechwarrior II to name a few. This little gadget is hard to find these days, and you’ll need a solid Windows 95 machine, the controller’s driver CD and the accessory programmer to get it running with extra classics. A shame really, for if QuickShot would have made this device more programming-friendly then they would have gone a much longer way with it.